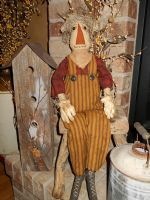 Gordon Scarecrow measures 26". He is made using stained muslin. His overalls are mustard and black stripped homespun and his shirt is bittersweet and black check. He is wearing a burlap hat with a sunflower on the brim. Gordon has been out working in the garden..just look at those dirty garden gloves! 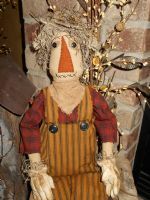 :-) This sweet little scarecrow will look wonderful in with your fall displays...$38.50. FREE SHIPPING IN 48 U.S. Others email me for shipping costs.